Taken with a Canon Power Shot SX200 IS on Indoor Mode. Specs: 1/60s, f/3.4, ISO: 320. I have been a lazy girl today and didn’t leave the house. Didn’t even get dressed! I spent the day mainly reading and uploading a blog post. Then I realised that I didn’t have my photo of the day, so what to do – take a picture of something in my house. 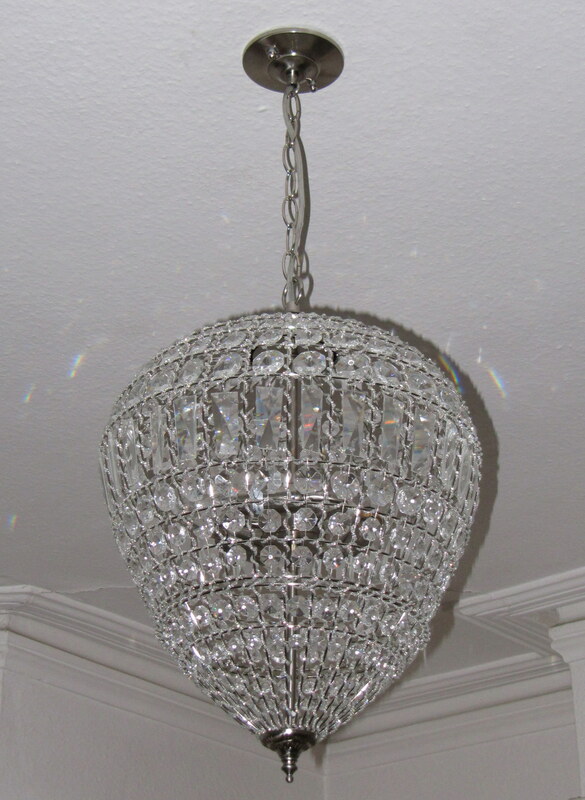 I had been photographing my sitting room earlier and took a photo of my chandelier. I love the pattern it makes on the ceiling and walls. Kind of like fire! 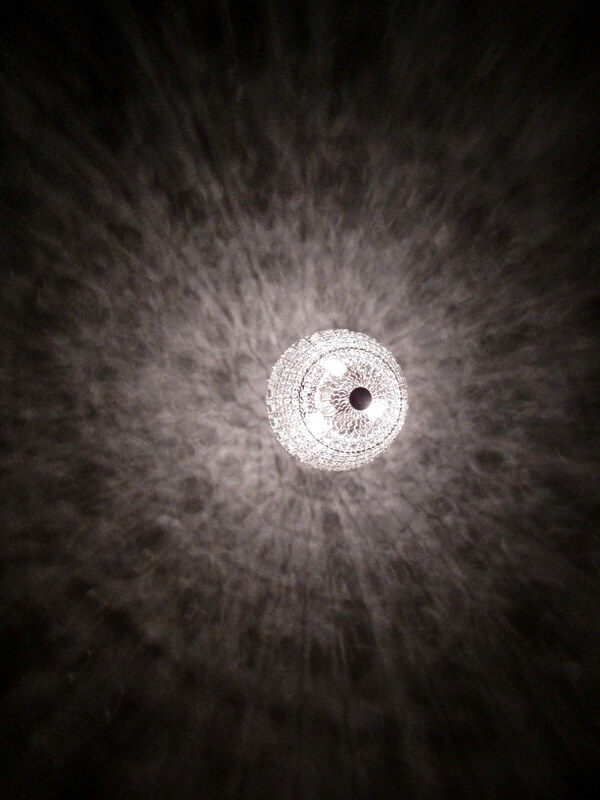 So I got on the floor and took a picture of my chandelier from there. I wasn’t sure how it was going to come out, but I really like it. I think it looks like a big eye or a planet in a galaxy. I love how the pattern on the ceiling almost looks like a heart shape. I am having a lazy day today and thought I would continue with the decorating theme I am a bit obsessed with at the moment. Yesterday I talked about buying pink sofas for my sitting room and realised that I didn’t have any pictures of the way it looks now, so here we go. The ceilings in my Living Room are 9’4″, the highest in the house. 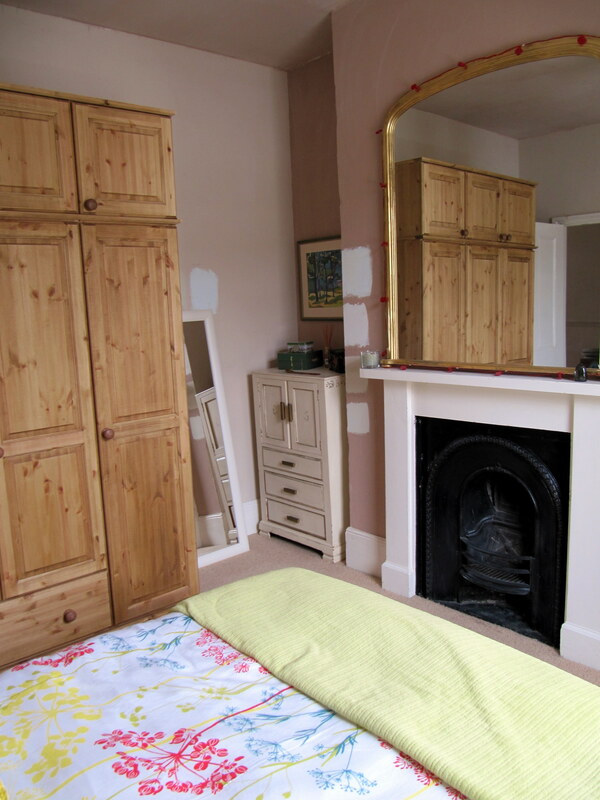 There are lovely original moldings on the ceiling and I am lucky to have a picture rail, which means that I can hang my paintings from there and not ruin the walls once the decorating has been done. The pelmet on the window is pretty nasty and has been here for over 2o years. All of the windows in the house have been replaced with engineered wood sash windows in keeping with the property, and because the old ones were aluminum and hideous and drafty. I took this photo this afternoon. It has been grey all day! I had to tack up the net curtains for privacy! You can see at the top of the photo that the new windows are slightly larger, which leaves no space to install a pelmet or curtain rail. 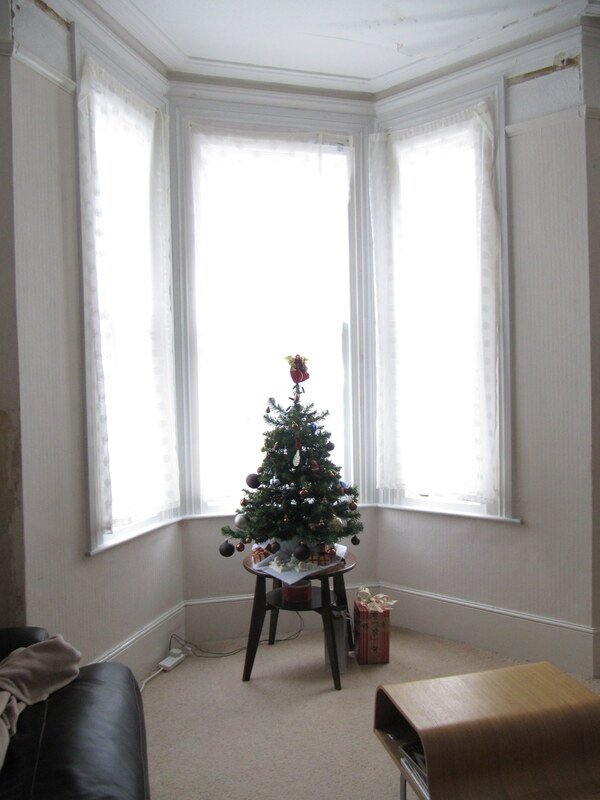 I’ve ordered tier on tier plantation shutters which should be here sometime in the new year. I will be so happy to have some privacy! You can also see that some paper has come off of the ceiling near the bay. There is a lead roof there that used to have a very tiny outlet and it got blocked and leaked into the Living Room. It was like this when I bought the house and then I had a leak since I’ve been here. I am leaving things as is until the decorators get around to it as I don’t want to damage the molding and there is a crack in the ceiling. In the window is the new table I bought for a fiver that I am going to re-paint. That is my little tree on top which will go in the spare bedroom next year. I didn’t do much with the decorations this year. I added to my Snowbaby collection! That’s it forever! They may not come out next year! My daughter bought the fabric for my Xmas stocking and I sewed it together! I want to use those colours in my house. The tiles in the fireplace are not as Turquoise as I thought they were. 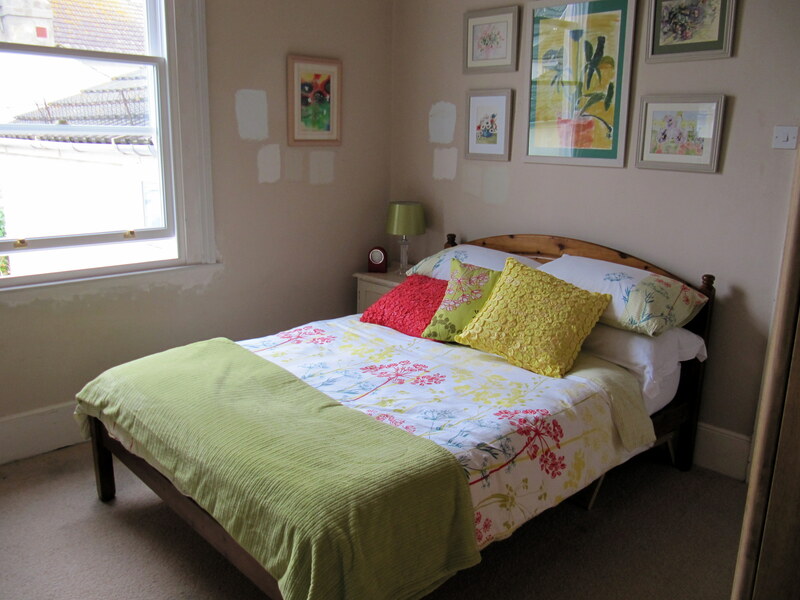 They are more of a grey/blue, so the paint I have chosen for the walls will work very well. 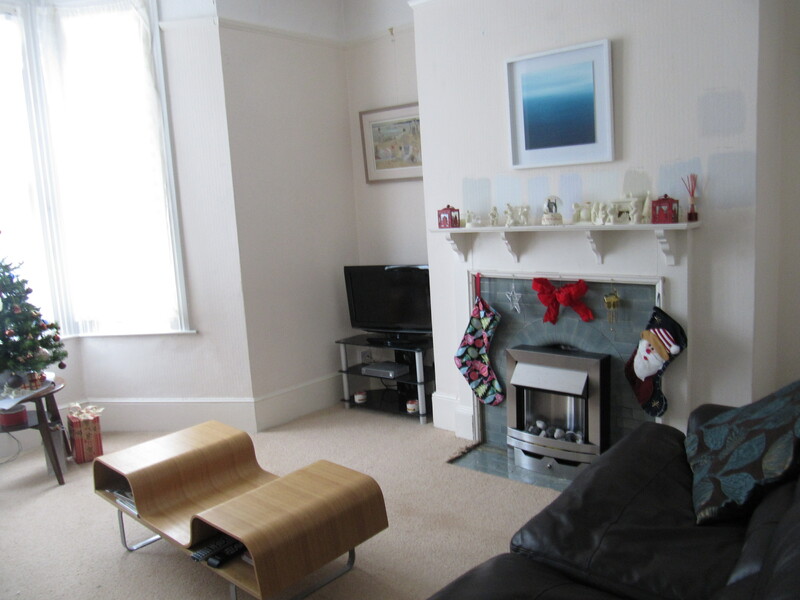 The fireplace is a bit tatty, but it is a working open fireplace and once I have the inside mended and buy a grate, I can have a real fire as I had the chimneys swept. I put a fake fire in front just for an extra boost as it can get a bit drafty in here. I need to renew the molding where the stockings are hanging from and clean the hearth tiles up a bit. I also need a cabinet to hide the TV!!! A lovely view of the sofabed. 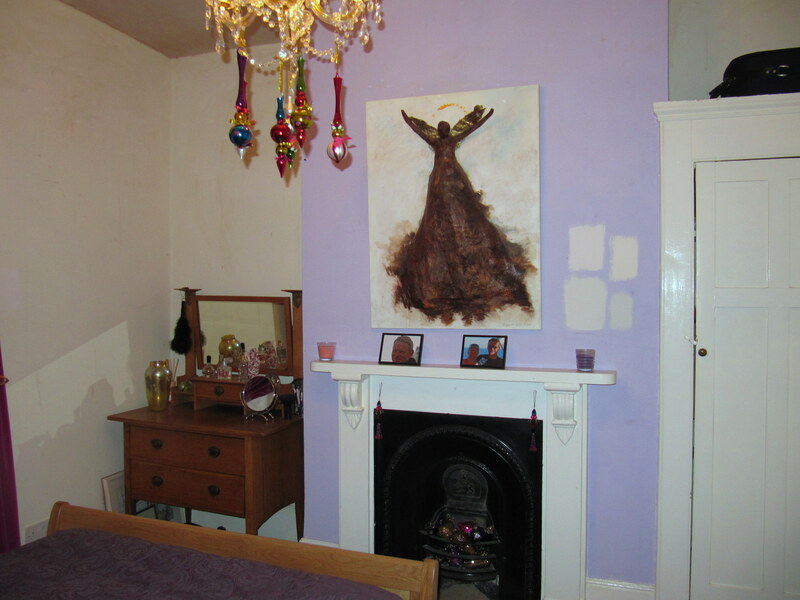 (76″ wide) It is in front of the radiator as I have nowhere else to put it. I know why people put rads on walls, but I wish they wouldn’t! The new radiator is going to be a tall one on the left hand side of the bay window. You can see my paint samples and where my painting used to be! I moved it because the heating is on! I need a really nice piece of furniture for that corner, preferably with some storage so I can put a lamp there and some photos of the kids. I’m also going to have to get rid of my Ikea oak coffee table. I just love the shape of it, but it really doesn’t go. I am going to try to find a low round table to work with the new one I bought yesterday. Here is a picture of the smaller sofa. (66″ wide) Tiger loves sleeping on fleece! My new sofabed is going to be 64″ wide and the small sofa is going to be 59″ wide. I will have more options on how to arrange the room. I would also like to get a very small armchair with a footrest, but will see if I can get one second hand. Something like the green one Vintage Vamp has in her living room would be ideal. My new sofas arrive in about 8-9 weeks, so I will be selling these leather sofas. I may have had them for 7 years, but they are in excellent condition and the sofabed has only been slept in a few times. They are very comfy and like new! Two people can easily slouch on the sofa to watch TV! All offers are welcome! Here is my chandelier! I love it! I got it at John Lewis. 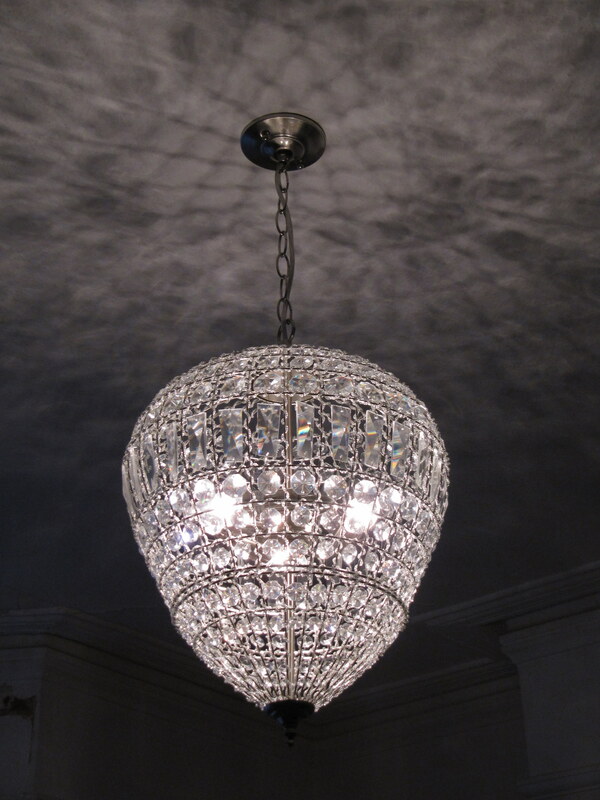 There is no ceiling rose as when the light is on, it makes a fantastic pattern! I just need to get a dimmer switch as this is a very bright light. Too bright! So that is my living room! 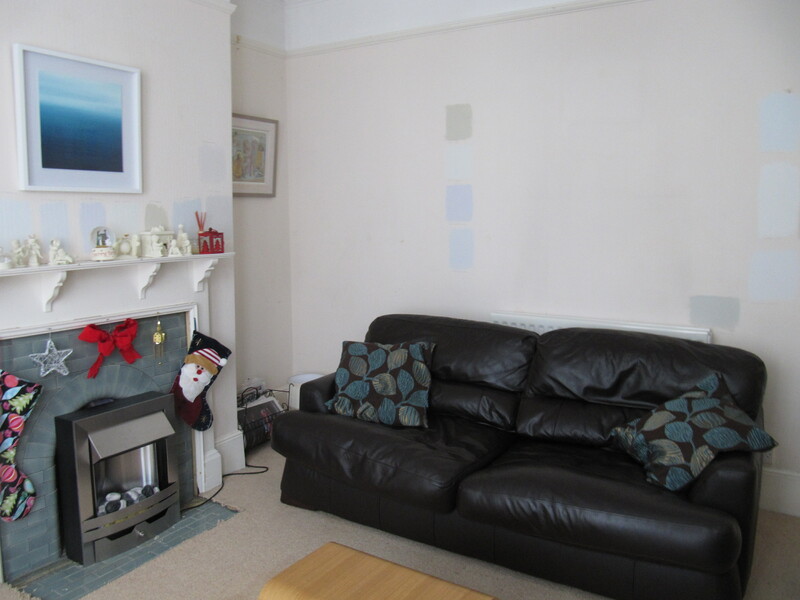 The whole house is pretty much painted this bland colour and has the same carpet throughout. The house used to be rented out, so I guess it was easier to maintain this way. Will update as things change. Any suggestions are always welcome. I have had a bit of free time on my hands for the last couple of months. I was so organised for Christmas you wouldn’t have recognised me. Because I had a lot of free time, I started reading decorating blogs. It is certainly less expensive than buying magazines! My first decorating blog was Visual Vamp. Valorie Hart is the partner of a Tango blogger friend of mine. Her Christmas posts led me from one blog to another. Through her, I was inspired to update my wreath. They now match the curtains in my dining room. 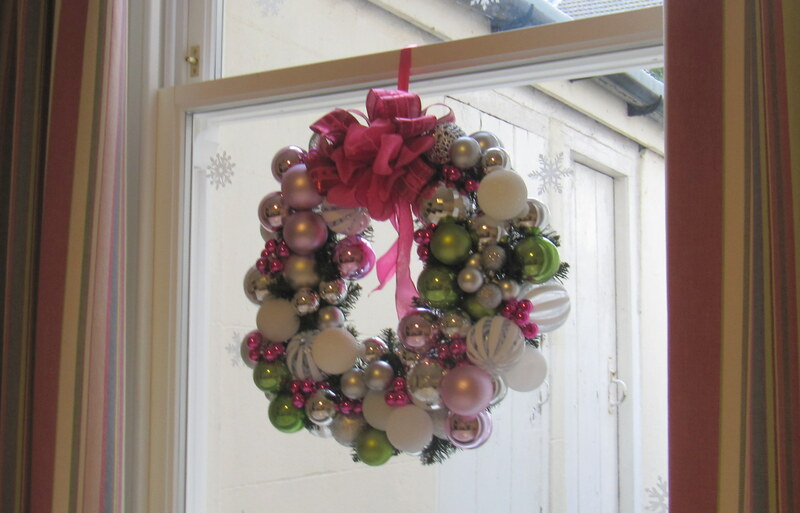 I bought unbreakable plastic baubles from the charity shops and pound shops and used garden wire to attach them to the wreath. I was going to make the coat hanger wreath by Eddie Ross, but I didn’t have a wire coat hanger. Maybe next year! I looked online (YouTube is great!) to find out how to make great bows and 3-D paper snowflakes. There is a mine of information on YouTube. Anyway, I hung the wreath in the window, but it doesn’t make for a great picture as I have the shed and downpipes to look at. I will have to find a better place for it next year but by then I will have my shutters installed, so who knows. So, I’m reading Visual Vamp and Eddie Ross (he is excellent on table settings) and start reading blogs that they read. This develops into a snowball effect. I find people who like things that I like. They give me ideas. 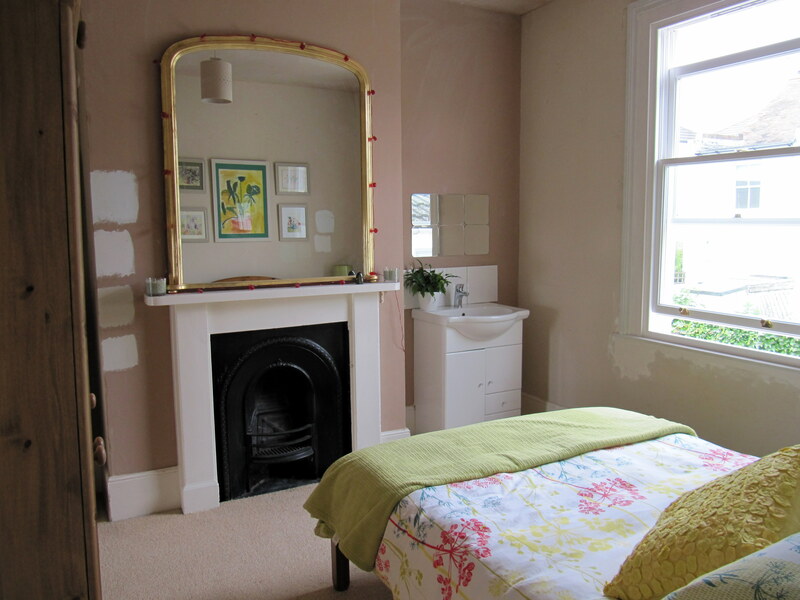 You see, I am not one that generally comes up with decorating ideas and styling. I am not creative in that way. I need a bit of help. I know what I like, but putting it all together doesn’t come easy to me and I need a bit of inspiration. Being a Gemini, my tastes can go from one extreme to the other. On one hand, I love classic calm colours, and on the other I love vibrant and bold colour statements. In the houses I grew up in, everything was tasteful, but bland – gold and green. My parents’ home has looked the same for the last 30 years. When I had my own homes, well, let’s just say I went through various stages of decorating. Colour was always an element even if I didn’t always get it right. This time, I want to get it right in my new house. From the moment I saw my house, I thought of it as a girl’s house. I could see myself looking out of the kitchen window as I do every morning when I make my coffee. I wanted to add feminine touches. My house is an old lady, and she needs a bit of updating. I don’t want her to be mutton dressed as lamb, but I do want her to be sophisticated and pretty. I have been reading about colour at Colour Me Happy. I can’t remember which blog I found her from. Greige has been the neutral colour for quite some time and is something I will be using, but I need something else to jazz it up. I saw a house on the road behind me that was tastefully done in greige, but it was so bland I could fall asleep. There was no personality. I want to give my home a bit of personality. One thing I have learned from working in the building and design industry, if you start with a neutral canvas, then it is easier to work with colour by adding artwork and accessories. I plan on having the flooring downstairs painted white. I’m not crazy about carpet on the ground floor. With all the white woodwork and greige walls, the living room and dining room will be crying out for colour. 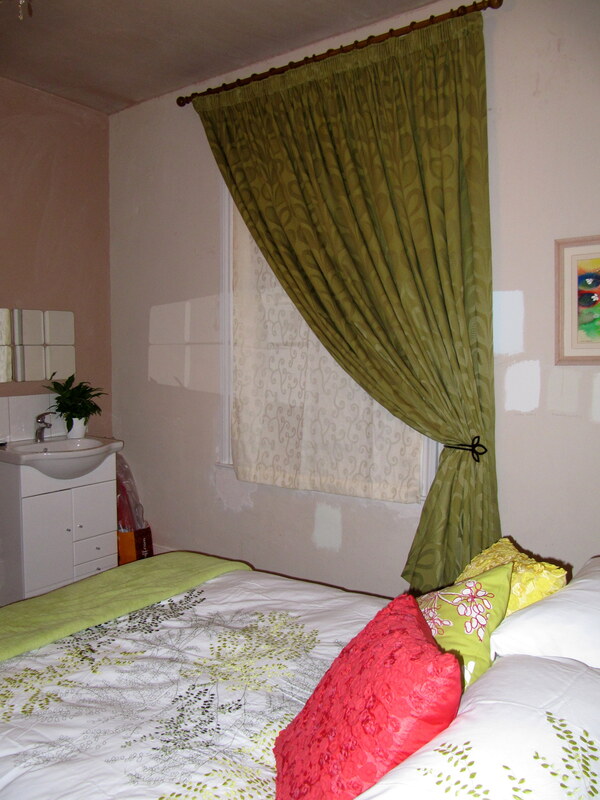 The guest room is going to be fresh with greens and a touch of red and yellow. I love this room and slept here until my new bed arrived. The sheets from Debenhams are called ‘Happy’. How appropriate! I can’t decide on the paint for the walls. The rest of the house will be painted Just Walnut by Dulux. It is a fawn grey and looks different in various light and walls. I am teaming it with Watercolour Green under the dado rail in the hallway. I love the greeny-blue, not quite turquoise look of it. It reminds me of the ocean. I’m going to have it in my office too! All of the woodwork and ceilings in the house will be white. The carpet upstairs will be neutral, some type of grey, but am waiting until the house is painted before I choose. I wanted my bedroom to be a bit glamorous and feminine without being too prissy. 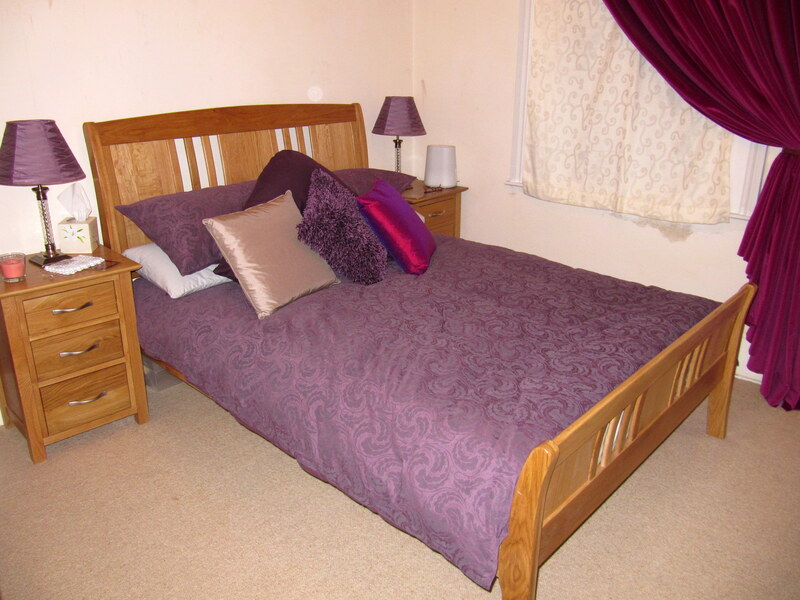 The colour of the bed linen really changes the feel of the room. 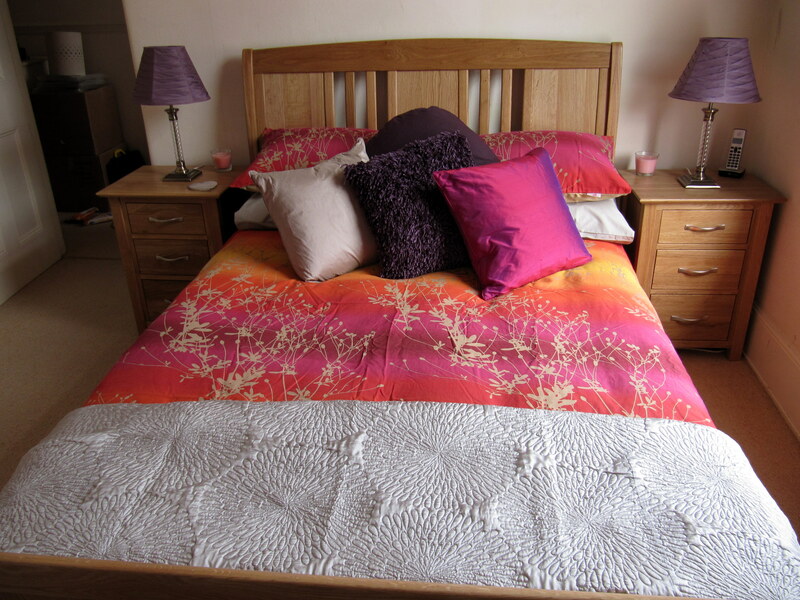 I have some hot pink sheets to go with the purple or grey duvet sets. I like to change things around. As you can see from the last photo, I Christmasfied my chandelier and fireplace a little bit! 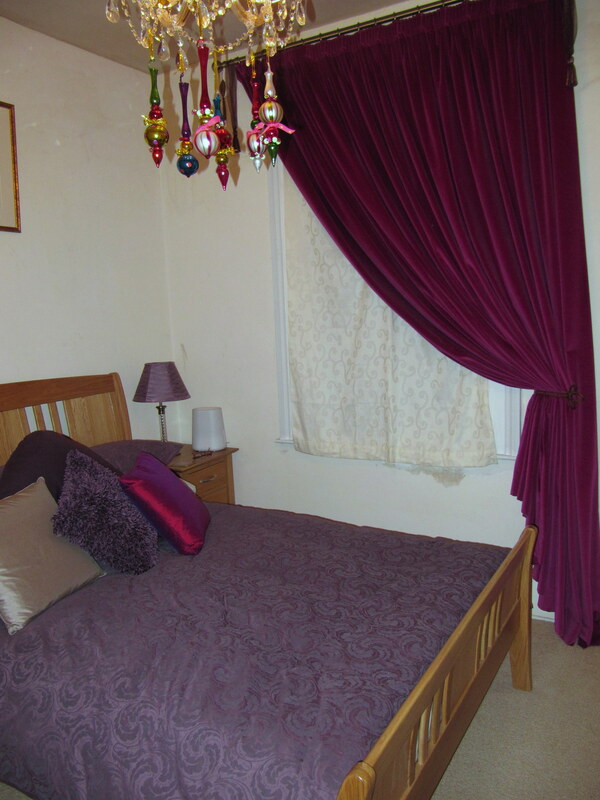 The curtains are a fuchsia velvet from Dunelm Mills. They really block out the light in the summer! Although I do like lavender, I am not crazy about it on the wall! It was there when I moved in. You can see some paint samples! 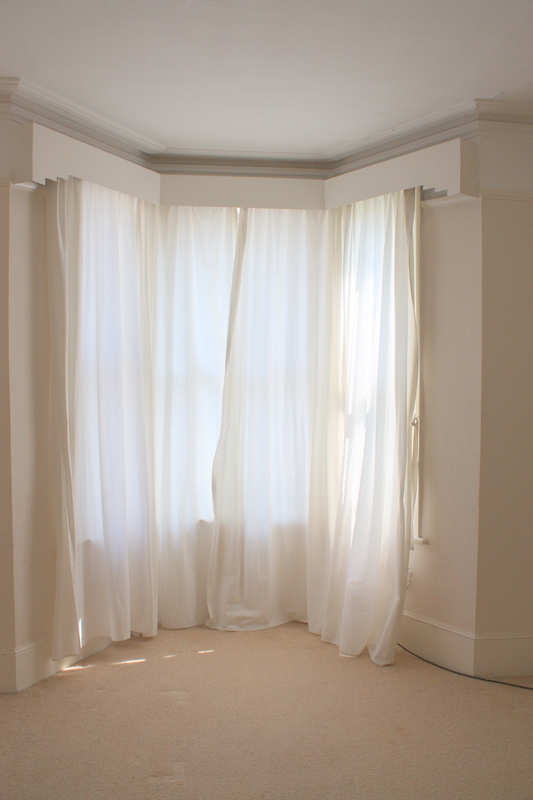 I am still waiting for my plantation shutters to arrive so I can get rid of that bit of beige curtain that I have been using for privacy. I love my little Arts and Crafts dressing table and the closet on the right is for shoes and handbags only! My living room is a bit bland and dull right now. I’m not crazy about the TV being on show and really need a cabinet to hide it in. My brown leather sofas are not cutting it. They are too big, and brown. They are in excellent condition, so I am hoping I can sell them off. 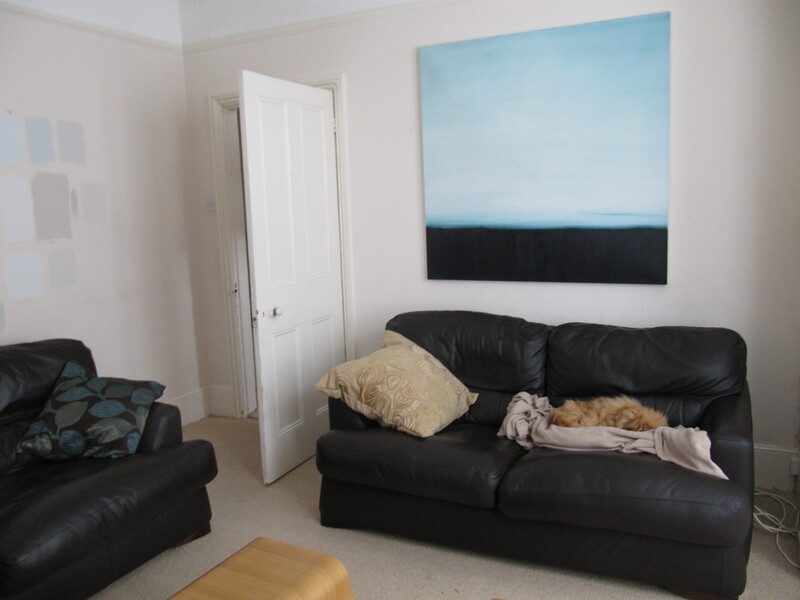 I need streamlined, modern, small sofas. I finally found a sofa and sofabed which I am having made up in fuchsia, with a spare set of covers in grape. I had my eye on a pink sofa for ages but didn’t have the nerve to go with my initial feelings about it. Pinks and purples look great on me! Actually, I like all jewel colours, so my sitting room might start out with pink sofas and end up looking like the colour of the rainbow once I add accessories. I had a bit of angst about going for the pink, but I went with my heart after I was inspired by some other blogs. I have some lovely paintings with a large amount of blue in them, so that should offset some of the pink. I discovered Mod Vintage Life from one of the blogs I had been reading. I really like her style for the home she has. If you click on her link you can see what I got so excited about. 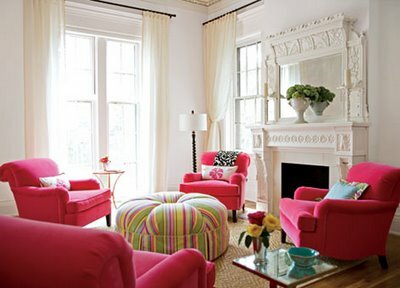 She has pink furniture! Actually, Honeysuckle. Her fireplace has Turquoise tiles (last year’s colour), just like mine. Her style is a bit more vintage and mine will be a bit more modern. Her house has yellow walls, and although it works in her home, it really isn’t a colour for me right now, though I might use it in a cushion. I don’t know from which blog I found Modern Jane, but if you scroll down her post (another about Honeysuckle) to the third photo, you can get an idea of what that bold colour could look like in a neutral room and is what inspired me to go ahead and order the sofas in pink. The uncanny thing about this picture is that the fabric in the striped footrest is almost identical to my dining room curtains. Photo credit Traditional Home. So, you already have an idea of the curtains in my dining room. I’m thinking of painting the walls Blossom White, which is a white with a touch of pink. My dining room table is 8 feet long and rectangular. The top is made of pine and the bottom is wrought iron with scissor legs. It’s a lovely trestle table. My dining room is only a few feet wider than the table! Right now, I have it shoved up under the window so we can walk around it on 3 sides. I thought of having the table made smaller to 5 feet, but even that is a bit awkward for the room because of the fireplace and think a round table will suit better, with a leaf if possible. I will be looking at the second-hand shops and auction rooms to find something. That means that I will also need new chairs. I could also use a nice corner cabinet. I am going to be sad to get rid of this table. I bought it from Habitat many years ago and have fond memories of dinner parties and the kids doing their schoolwork there. I also used one end of it as my office! Well, this room is certainly going to be a project. As for the kitchen and bathroom, I know what I want. I just need the right person to do the work. I’ve been asked how things are going with my house and this is how it is. There is a bit more upheaval to deal with, but hopefully I will be working by then when the work is taking place. In the meantime, I get ideas and I go shopping. What else? I will keep you posted as and when things progress.